Khwajeh Shams al-Din Muhammad Hafez-e Shirazi (also spelled Hafiz) (born between 1310 and 1337, believed to have died at age 69) (Persian: خواجه شمس الدین محمد حافظ شیرازی‎) or Hafez is a Persian poet. Hafez was born in Shiraz, Iran. Hafez learnt the Quran by heart at an early age. His poems are collected in Divan e Hafez. William Jones translated his work into English in 1771. Despite his profound effect on Persian life and culture and his enduring popularity and influence, few details of his life are known, and particularly about his early life there is a great deal of more or less mythical anecdote. Some of the early tazkeras (biographical sketches) mentioning Hafez are generally considered unreliable. 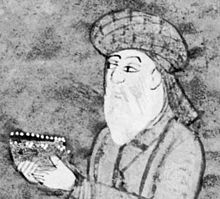 One early document discussing Hafez' life is the preface of his Divān, which was written by an unknown contemporary of Hafez whose name may have been Moḥammad Golandām. The generally accepted modern edition of Hafez's Divān is known as Qazvini-Ḡani, edited by Moḥammad Qazvini and Qāsem Ḡani. It is said that, by listening to his father's recitations, Hāfez had accomplished the task of learning the Qur'an by heart, at an early age (that is in fact the meaning of the word Hafez). At the same time Hāfez is said to have known by heart, the works of Jalal ad-Din Muhammad Rumi, Saadi, Farid ud-Din and Nezami. According to one tradition, before meeting Hajji Zayn al-Attar, Hāfez had been working in a local bakery. Hāfez delivered bread to a rich quarter of the town where he saw Shakh-e Nabat, allegedly a woman of great beauty, to whom some of his poems are addressed. In the knowledge that his love for her would not be requited and ravished by her beauty, he allegedly had his first mystic vigil in his desire to realize this union, whereupon, overcome by a being of a surpassing beauty (who identifies himself as an angel), he begins his mystic path of realization, in pursuit of spiritual union with the divine. The obvious Western parallel is that of Dante and Beatrice. At age 60 he is said to have begun a chelleh-nashini, a 40-day-and-night vigil by sitting in a circle which he had drawn for himself. On the 40th day, he once again met with Zayn al-Attar on what is known to be their fortieth anniversary and was offered a cup of wine. It was there where he is said to have attained "Cosmic Consciousness". Hāfez hints at this episode in one of his verses where he advises the reader to attain "clarity of wine" by letting it "sit for 40 days". This page was last changed on 19 January 2018, at 13:21.